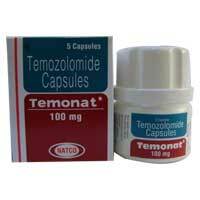 Temodal is a medicine that contains the active substance temozolomide. It is available as capsules. Temodal is an anticancer medicine. It is used to treat malignant glioma (brain tumors). Temozolomide is used to treat specific types of brain tumors. Temonat contains temozolomide and belongs to a class of drugs known as imidazotetrazine derivatives.Temonat is used for the treatment of certain types of brain cancers (e. g. , refractory anaplastic astrocytoma).Temonat slows or stops the growth and spread of cancer cells in your body.